Services resume after 11:30 a.m in the Bengaluru Metro. BENGALURU: Bengaluru’s commuters this morning found that Metro services had been shut down owing to a quarrel between the transport utility’s employees and some policemen. 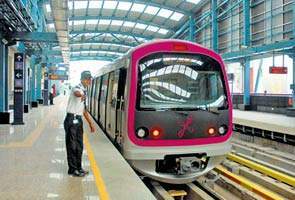 A flash strike by employees of the Bangalore Metro Rail Corporation Limited (BMRCL) disrupted operations for most of the morning, but services resumed at 11.30 am. By then there had been widespread disruption of the city’s transportation network and commuters vented their frustration on social media. Following the wildcat strike, the Karnataka government imposed the Essential Services Maintenance Act (ESMA) on the transport utility, barring staff from continuing the strike. A notification issued by the state government under Section 3 of the Act prohibited BMRCL employees and officials from staging any protest that would disrupt services. The employees were incensed that the Halasur Gate police had arrested six BMRCL employees for assaulting policemen. Metro commuters who went to the stations were sent back by officials who only said operations were closed due to ‘unscheduled maintenance’. BMRCL personnel staged a protest against the arrests and demanded release of the detained employees. They staged a protest at Byappanahalli police station. The BMRCL currently operates in two lines in Bengaluru: The Green line between Nagasandra and Yelachenahalli, and the Purple line between Baiyappanahalli and Mysore Road. Regular services begin at 5 am. According to sources, the number of commuters who use the Metro during the morning rush hour is close to a lakh. The number of users has topped three lakhs since the whole section of the Green Line became operational recently. The trigger for the strike was a minor scuffle between BMRCL employees and Karnataka State Industrial Security Force (KSISF) personnel at the Sir M Visveshwaraya Central College station on Thursday. A minor scuffle was reported between one Rakesh, a BMRCL employee, and Anand Guddad, a KDISF staffer, at around 6.10 am Thursday. Rakesh, while entering the station, refused to scan his bag at security check, stating that he was an employee. When Guddad insisted he run his bag through the scanner, it resulted in a minor scuffle. His bag was forcibly scanned by security personnel. At around 9.40 am, Rakesh came back with four of his colleagues and assaulted Guddad and two others. A police complaint was filed.